By early 1944 the Americans’ westward drive across the Pacific required airfields in the Marshall Islands, at Kwajalein and Eniwetok atolls. In late January, the 4th Marine Division and U.S. Army troops wrenched control of Kwajalein Atoll in three days of heavy fighting. Then, beginning February 18, the reinforced independent 22d Marine Regiment landed on three islands in Eniwetok Atoll. The three newly rebuilt former Japanese airfields at Kwajalein and Eniwetok would support operations in the Mariana Islands as the Marine Corps continued its island-hopping campaign to victory in the Pacific. Military historian Eric Hammel has delved deeply in government photo archives and discovered a treasure-trove of rare, many never-before-published combat photos taken during the Pacific War. 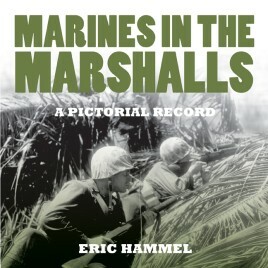 Covering the brief but violent battles on five tiny islands in the Marshalls has yielded this record of more than one hundred seventy photos and captions alongside Hammel’s concise narrative. As such, Marines In the Marshalls serves both as the campaign’s best visual record and an enduring tribute to the Marines who fought their way ashore at Kwajalein and Eniwetok atolls.